Email marketing is one of the effective marketing strategies that can drastically improve your brand’s impression and can drive huge traffic to your website. It is not just an easiest and effective way to communicate with the target audience but, also an image creator which creates your brand's image in front of the users. Many Digital Marketing Companies say that email marketing is the most effective way to approach the relevant customers directly. The active email users keep on checking their emails and they do respond the emails if required. Email marketing is the most professional and impressive marketing approach that stays in the inbox of the customers until they delete it. To delete that mail, customers need to open it at least once and the turning point here is the email content. Always research about the latest marketing trends as you can’t just blindly trust the marketers. There are Things Experts Told You Wrong About eCommerce PPC. Many marketers don’t use it in an appropriate way and when their Email Marketing strategy fails, they think that this isn’t a working strategy for their business which is obviously a misconception. 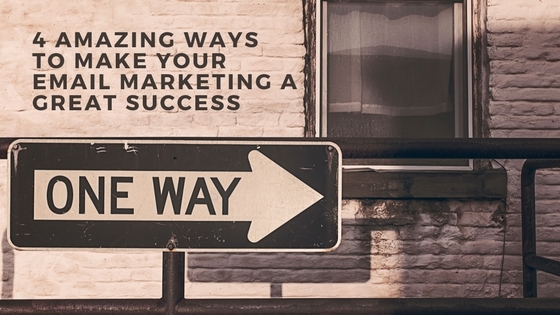 Here we present “4 Amazing Ways to Make Your Email Marketing a Great Success”. Let’s begin. It is most of the marketer's tendency to pay for an email list. They think paying for it will bring the genuine customers to them but, it is not true. The list they pay for is actually just a list of some random customers who are for sure not relevant to their services. Buying an email list can work once in a while but, not always. If you are looking for a targeted and relevant audience, you should pick up your existing customer’s email list or the emails you get while the visitors sign up on your website. It will get you the most relevant customers without paying for that. Email marketing can be very easy if you use the best email automation tools for that. Using a nice email automation tools will save your time, resources and money. Include this in your DigitalMarketing Strategies and see your business grow. To enhance the effectiveness of your email automation tool, you should develop the best content and to develop the best content you must know these amazing Insights from the 2018 Intelligent Content Conference. Do check for the bounce rate of your emails and manage it with extreme care. Maintain a separate bouncing list of the emails and keep checking the improvements on the regular basis. If required delete the faulty email id’s otherwise it will affect your overall performance.